Holly is here with an easy way to add something a little non-traditional to your Christmas tree (or steal it to wear in your hair for a holiday party) and photos of her own beautiful tree. I love anything that does double duty! Thanks, Holly. 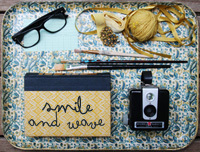 Happy December Smile & Wave readers! 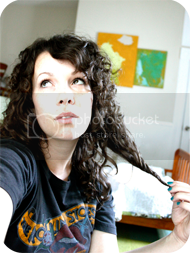 I'm Holly, and you can find me over at Create*Loves blog. Christmas is my favorite time of year, and one of my favorite traditions is decorating the tree. Growing up, this was always a much anticipated event that involved careful placement of each very sentimental ornament, Boney M playing, and excitement all around. Since having my own home, I have enjoyed the freedom to choose whatever theme I want for the tree each year. 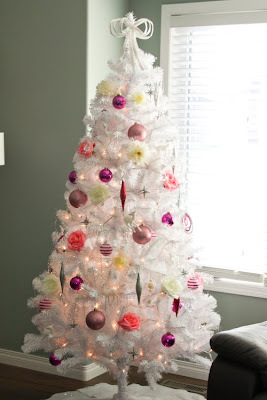 This year, I have a white artificial tree, with silver and pink ornaments. 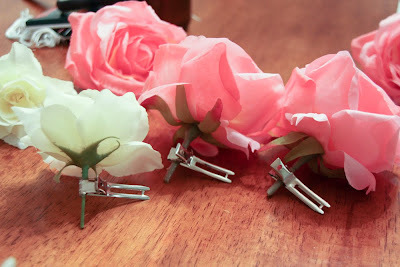 I felt like going more "out of the box", so I decided to make my own ornaments out of silk flowers and hair clips. I wanted my tree to have more of a kitschy and girly look. Use a wire cutter to cut the stem down to about 2 inches. 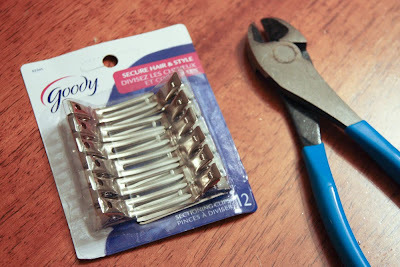 Use a hot glue gun and glue the stem to the inside gap of a hair clip. Make sure to stay away from the spring though, to allow the clip to close properly. Allow to cool, and you're done! You're ready to clip them anywhere on your tree! 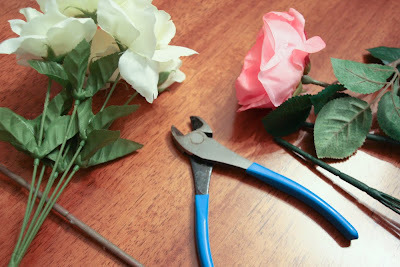 I used large roses, in white and pink. You can also use silk poinsettias for a more traditional look. Silver ones would suit a white tree perfectly! 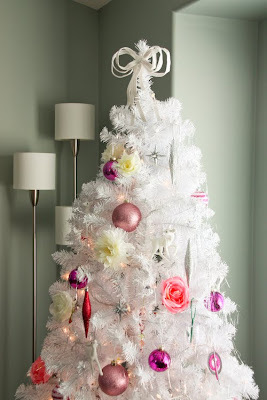 Imagine a Christmas tree decked out with all sorts of flowers, almost completely covered! Who said you always have to be traditional? 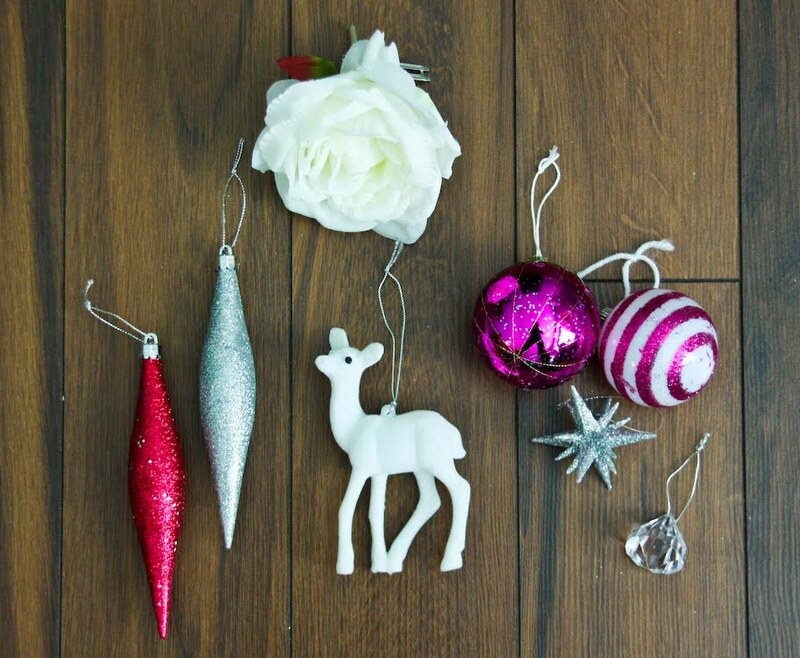 My ornament theme this year is white/silver/pink, balls, flocked fawns, starbursts, sparkle, jewels, and flowers! Holly lives too far away from Springfield for my taste but I enjoy hearing about her favorite teas, Blythe news, and favorite links on Twitter. She also has a train loving boy and a vintage wearing baby girl and is always inspiring me with her hair and fashion posts on Create*Loves. Thanks so much for your adorable contribution, Holly! That tree is so adorable! 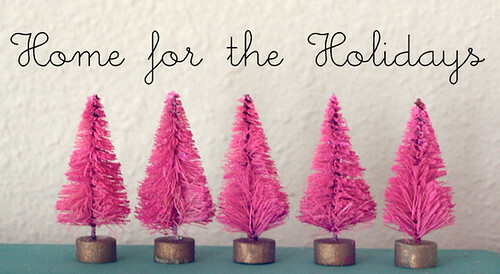 I've never considered putting up a white tree, but I saw a pink tree in the store yesterday & I think I have to have it. I love the idea of flowers as ornaments & the fact that they are re-usable as hair clips. I'm definitely doing that this year. I love that idea! So great to put flowers all over the tree! It would look super awesome on that white one. I just love a white tree. Lovely idea, not sure my Man would go along with it but would look fab on my little pink tree. That is one cute tree! The tree and the flowers are both so lovely and beautiful! 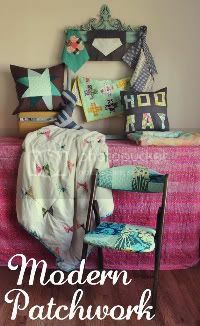 I wish I was that creative!